Albert Camus said that "Autumn is a second spring when every leaf if a flower". Everybody who heads out for holidays or just an evening stroll in the months of Autumn wishes to capture those colours of foliage into their camera forever. 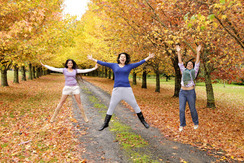 With digital cameras becoming a commonplace, it is easier than ever to capture your perfect autumn picture. Most "point-and-shoot" cameras these days have advanced automatic colour, white balance and exposure calculating algorithms which helps in getting that perfect shot. Below are some tips that will assist in getting some better photos. Last weekend (Easter and Anzac Day ), we headed out to Robertson (highlands, NSW) and stayed it a wonderful picturesque estate. As soon as we entered the main gate of this place, we were welcomed by a perfect autumn drive way and I decided to do a shoot at that location along with my friends. Below are a few photos that I was able to capture. 1. Light is the colour your pait your photos with. Lots of photographers prefer shooting in the "golden hour" which is the hour just after the sunrise and the hour just before the sunset. The sweet light of the sun during this period accentuates the orange, reds and the yellow of the leaves on and off the trees. 2. Choose your days - If you are able to choose, shoot on an over-cast day, this will also allow those colours of the leaves to "pop-out". This also gives you an even spread of the sunlight peeping through those clouds. 3. Aperture: If you are shooting with an SLR, try and play around with the aperture, to get some remarkable photos. This will dictate if the back-ground of the photos is blurred out or visible enough. The photo below was taken at an aperture of 4. This allowed me to blur the background just enough to give that "dreamy" look but still be able to see the wonderful tree-line. You will notice that the foreground is also blurred out due to the low aperture number. 4. If you are out on a bright sunny day, you may notice over saturation on some parts of the foliage where sun-light hits directly. You have two choices here; one is to use a Polarising filter. This helps reduce the glare from the sun-light and give a better contrast to your photos. If you do not have a polarising filter, try to under-expose your photos a little (one stop). This will ensure that details of the photo are not lost (white saturated areas). You can easily increase the exposure/brighten the photos using softwares like Picassa. You can also use a flash to ensure that your subject is correctly exposed. 5. Tripod it - If you are shooting during the "golden hours", you may want to use a tripod to ensure sharp photos. If you shoot anything below 1/60, you should use a tripod (for stationary objects). 6. White-balance - Play around with that white-balance setting on your camera. Most digital camera these days, allows the user to change this. Don't be afraid to experiment with this feature. It is pretty straight-forward to use and you will get some amazing results. 7. Compose your shots: Apart from the colourful leaves, try and compose your shots to capture the surrounding features as well. Things like a road that leads to no-where, tree-line, contrasting colours of lush green lawn and autumn foliage, sunlight seeping through the trees, etc. You should also use different perspective, different angles to shoot. For example, I took the below photos standing on a stump of a tree with my subject at an unconventional angle. I hope the above tips would help all hobbyst and enthusiast photographers take better, colourful, vibrant and sharper autumn pictures.